Meeting friends to ride with has never been easier. Are you ready to meet new friends? Drivebook is available on any mobile device! Download now to get started. Alternatively you can use the Web App (less features). Owning a motorcycle is a way of life. Drivebook improves this experience by providing features like a nearby map to find close by bikers, groups for your friends, your own garage, ... AND a big community in which everyone has the same passion. 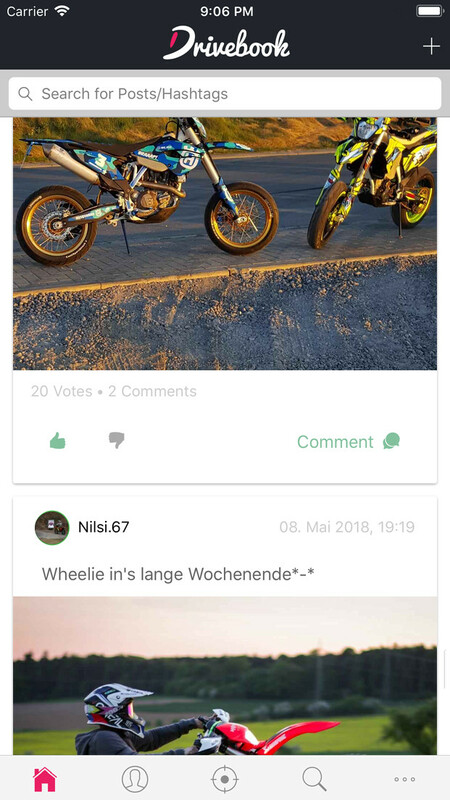 Meet nearby bikers fast & easy! Share your memories and pictures with a community having the same passion like you! The community always has an open ear for your bike specific questions. © Drivebook 2018. All Rights Reserved. Drivebook ("us", "we", or "our") operates the https://www.dvbook.de website (the "Service"). The iOS-App is ready. It just needs to get unlocked by Apple. Until then you can use the Web App.